Primary sclerosing cholangitis results from inflammation and fibrosis of the bile ducts leading to multiple areas of narrowing throughout the biliary system. The cause is unknown but immunological mechanisms have been implicated. HLA associations have been reported with HLA-B8, DR3; HLA-DR52a and HLA-DW2. DR4 marks for rapid disease progression. Fifty per cent or more of patients have inflammatory bowel disease, but this may be asymptomatic. Patients with AIDS have been found to have sclerosing cholangitis. The cause here is unclear but infection particularly with Cryptosporidium parvum is a probable aetiological factor. There may be no symptoms and the diagnosis is suggested by a raised serum AP but a negative mitochondrial antibody. Symptoms that may fluctuate are pruritus, jaundice and occasionally abdominal pain. Portal hypertension can develop. Liver biopsy shows a fibrous obliterating cholangitis with eventual loss of interlobular and adjacent septal bile ducts. An ERCP will show the multiple strictures. Treatment is unsatisfactory. 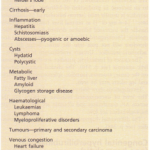 In half of the patients the disease runs a benign course over many years. Steroids and azathioprine are of unproven value but seem to help some patients. The results with methotrexate are encouraging. In associated ulcerative colitis, colectomy does not affect the progress of the condition. Obvious extrahepatic biliary strictures can sometimes be dilated or stented at endoscopy. Liver transplantation is now being performed for this condition. 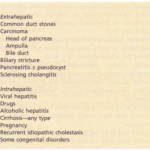 Occasionally cholecystitis occurs in patients with diabetes mellitus, polyarteritis nodosa and systemic infections. Cholesterolosis of the gallbladder In this condition, deposits of cholesterol are seen in the mucosal wall, producing a fine yellow pattern on a red background (strawberry gallbladder). Cholesterol stones mayor may not be present. The relationship to symptoms is unclear. This may be found as an incidental finding on a cholecystogram and consists of thickening of the mucosal and muscle layers with the presence of Rokitansky-Aschoff sinuses, often associated with small gallstones. It does not usually produce symptoms. This is a congenital cystic dilatation of the extrahepatic ducts producing jaundice and abdominal pain. Fifty per cent of the patients do not present until early adult life. Treatment is surgical. Haemobilia can occur due to hepatic trauma, sometimes from a tumour, and rarely after liver biopsy. Blood enters the biliary tree and produces either obstructive jaundice or gastrointestinal bleeding.